Bemis is very proud and excited to unveil our newest addition: A beautiful keystone that will be used to reflect our strong commitment to Character Education. The students at Bemis must demonstrate good citizenship as well as excellent scholastic achievement and outstanding academic skills. As a result, Bemis staff instituted Character Education so students would understand and demonstrate the principles of good character including kindness, respect and responsibility. An artist was commissioned to create a keystone that reflected the qualities of good character and included the distinctive and exciting traits about Bemis. His ingenuity inspired him to integrate and honor Bemis’s history, while highlighting the present and looking ahead toward the future. The keystone is rich with symbols to delight our Bemis community while integrating the past to the present in a child friendly way. Historically, Bemis was the first school to be heated and cooled by solar panels, which was innovative in 1980. To reflect this ground-breaking advancement, the mascot at Bemis was a satellite, and our monthly newsletter named “The Solar Scoop” was initiated, and this bimonthly newsletters continues to be published under that name now. The Bemis Bear, our current mascot, was created later as a child friendly mascot, and the paw print was added to delight older Bemis students. Look carefully at the Bemis Keystone and see if you can find the symbols that are described in detail below. The artist and the committee selected one of the most famous constellations, Ursa Major, The Great Bear, to connect the solar panels and the solar scoop of the past with the bear and the bear print of the present. The Great Bear is displayed proudly on the Keystone. This constellation shares two major stars with the Big Dipper. Ursa Major, The Great Bear, connects the solar or space theme with the bear theme in a relevant way. The constellation has both large stars, which represent the staff, connected to small stars, which represent the students. The constellation is surrounded by other special stars, which represent the parents supporting us on our journey of learning. 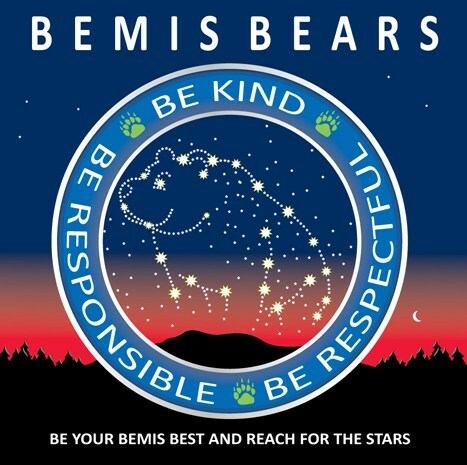 The stars are all connected together to form an image of a bear to illustrate the relationship to the Bemis bear mascot. This represents the importance of relationships between our staff and students here at Bemis. It also suggests that all of our staff and students are shining stars. The bear is sitting on top of the foothills of Michigan, which represents that the bear has reached the summit. Bemis’s mascot is looking up into space dreaming about reaching for the stars and envisioning future goals. This new constellation logo connects the vision for the future with space, the final frontier. It also connects the original architectural history of the solar panels to the current adoption of the bear mascot. The red, white and blue hues in the keystone represent our school colors. Our mission at Bemis states that ALL students will learn. Therefore the oval telescope lens surrounding and focusing on the constellation and the bear demonstrates our commitment that all Bemis students will be successful.